Saturday is a day of getting things done, of making yourself useful, and of doing what needed to be done on Monday but you were too busy then, so you put it off until Saturday, hoping it wouldn’t rain, but the forecast doesn’t look so good, and now you’re thinking next Saturday might be better. Yes indeed, there’s no other word in the English language that means “work” more than Saturday (except for maybe the word “work”), but in order to be successful at getting something done, it's very important to develop a routine and stick to it. My Saturday routine consists of waking up early, fixing myself a hug cup of coffee, reading a couple of home improvement magazines to get lawn and garden ideas, then immediately going back to bed and not getting up until lunch time. When I finally do get up, the first thing I do is create a plan for accomplishing whatever it is I might think about doing for the day. You can’t just go about doing things all willy-nilly, hoping to discover what it is you want to do. No sir! You have to give some actual thought to what you might want to do, then write it down on paper in outline form, making it easy to be followed to the letter. 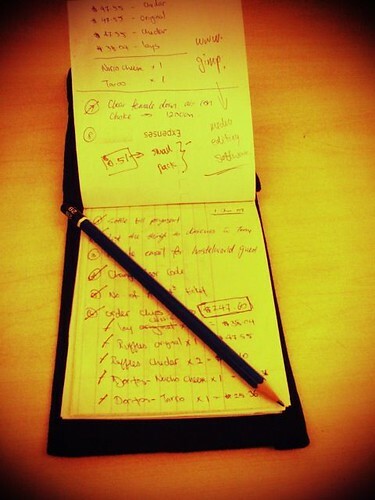 (Some people write down their plans in an official-looking notebook. I prefer to write mine on the back of old Wal-Mart receipts – because they’re easier to lose). WARNING: Never develop a plan without having a “Plan B.” If your initial plan does not work like you envisioned, it’s much better to change direction than it is to give up and settle for getting nothing accomplished. Unless, of course, giving up and settling for getting nothing accomplished IS your “Plan B,” then that’s okay. Come to think of it, I think plans are overrated. Nothing can ruin a good “getting something done” day faster than having to follow a plan. That’s why I believe that once you have your plan all written down, you should throw it away and go outside and wait for inspiration. If nothing happens within five minutes, go back inside, open up the fridge and wait for inspiration there. Amen! Every time I make a plan I spend more time stressing out about how nothing is going according to plan... the control freak emerges and she's not pretty. So I usually just sniff my way through the day like a dog. It's a "willy nilly" approach to life, but when I look back on my week, I've found I actually got some things accomplished.